Dr. Cheston is an experienced performer and church musician. Her solo CD, Praise and Worship, was released in 2002. She has served as a church pianist/organist, soloist, choir director, and worship leader. She has performed as a singer/pianist in solo concerts, for church services, prayer breakfasts, church retreats, community events, and in various other settings. As a composer/clinician, Dr. Cheston shares with her audiences her techniques for composition of theater scores, instrumental and vocal/choral pieces, and sacred music. 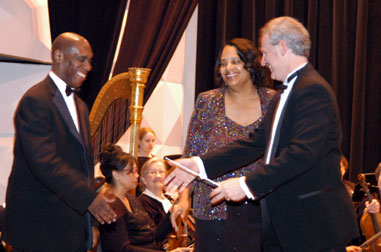 Dr. Cheston's commissioned choral work, Freedom Medley, was premiered at the 2002 Dr. Martin Luther King, Jr. Celebration in Oberlin, Ohio. Dr. Cheston participated in the Artist-in-Residence Program at the Cleveland School of the Arts. During her residency, she composed, orchestrated, and arranged scores for two original musicals,Chicken Little and The Butterfly That Stamped. These productions were performed at the Ohio Theater in the Playhouse Square Entertainment Center. The Cleveland School of the Arts received the following awards for Chicken Little: The Northern Ohio Live Magazine 1984 Award of Achievement in Theater, theCleveland Critic's Circle Carolyn Reid Award for Educational Theater, and Chicken Little was cited in the Cleveland Plain Dealer as one of Cleveland's Top Ten Arts Events in 1984. Chicken Little was revived in a performance in 1992 by Arts E.T.C. (Arts Education Theater Company). Also, The Butterfly That Stampedwas revived in 1992 in a run by Warrensville Heights High School. Dr. Cheston's Praise With Pizzazz (Volumes 1 and 2) has become a favorite song collection among children's choir directors and ministry leaders. As a composer of children's songs, solo pieces, and choral music (over 50 praise and gospel songs, non-sacred music, and music for school use), Dr. Cheston relies on her experience as a certified public school music teacher/choir director and her background as a college and church choral director. Having taught music classes at every level, from pre-school music classes to undergraduate and graduate courses in music education, Dr. Cheston uses her knowledge of the range and capabilities of the voice at various developmental stages to create music that is harmonically rich and rhythmically exciting, as well as technically appropriate. Adapted for this performance by Sharon Brown Cheston, Ph.D.
As an ethnomusicologist, gospel piano clinician, and the author of Afro-American Gospel Music: Piano Accompaniment Performance Practices, Dr. Cheston educates her audiences about the piano and vocal aspects of gospel music. In her lectures, which she augments with the performance of musical examples, Dr. Cheston discusses the various elements of music that undergo improvisation to conform to the gospel style. She has lectured throughout the United States, including an appearance as featured lecturer at the Arizona Dranes Forum, University of Massachusetts at Amherst; a lecture/performance at the Society for Ethnomusicology Meeting, State University College at Geneseo, Geneseo, New York; Case Western Reserve University's Saturday Seminar Series in Music Education; and Ethnifest at Cuyahoga Community College, Metropolitan Campus. In addition, she has presented workshops at Oberlin College, at the 2004 and 2003 Ohio Christian Education Association's Christian Ministries Conferences, at the college-based Inter-Varsity Christian Fellowship Regional Conference, and has lectured at Kent State University.